Summer is (finally) here in Chicago, and in my mind the summer season is pie season. Thanksgiving has selfishly drawn pies into its orbit, but I can’t think of a better time to enjoy pie than when so much fruit is finally in season! So ok, apple pie is a big dog in the pastry world come autumn, but why not bust it out on our most American of days, July 4th? How rockwellian would that be? Apple pie is also some sacred territory. Recipes, techniques and styles are deeply rooted in family tradition and our own personal psyche. I’m not going to sit here and tell you I plan on giving you an apple pie recipe you like better than your mom’s or grandma’s (if I do, be sure to call them up and tell them I said “in yo’ face!”), but maybe just a variation that will change your thinking on what pie can be. Who knows, maybe we can start a new tradition? Enjoy! The kind of apples to use in an apple pie is an important question. 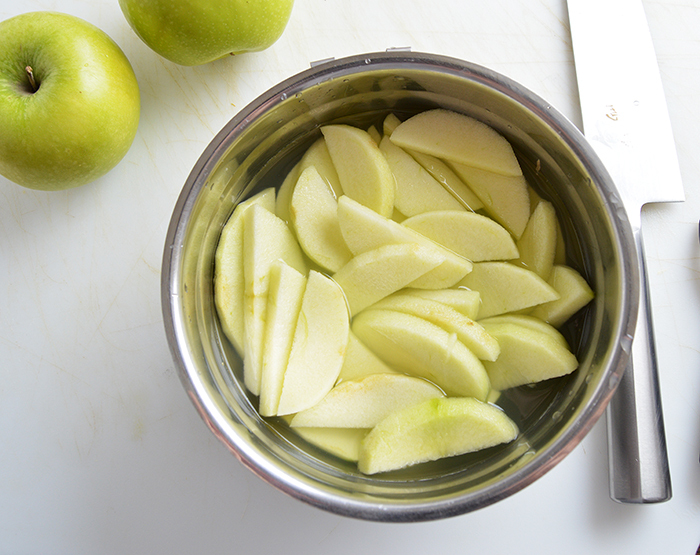 Granny smith is almost always the go to apple, because it has a firm texture that holds its shape during baking and a tart flavor that balances well with a sweeter filling. I’m all for using granny smiths, but also like to add a few braeburn apples for good measure. 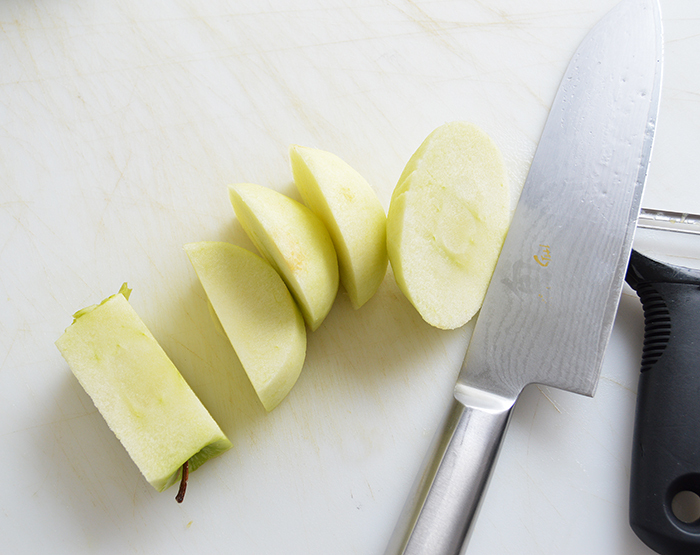 Braeburn apples cook beautifully and have a great flavor that works well with granny smiths. 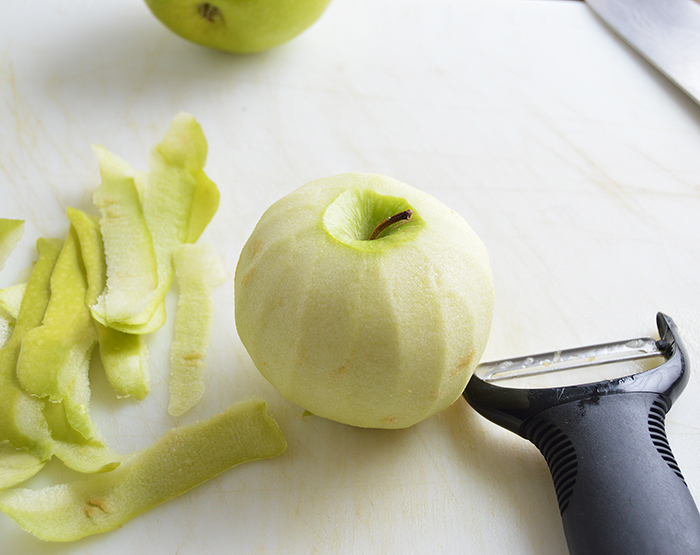 Just avoid apples that are too sweet or mealy in texture. You can’t go wrong with an all granny smith filling, but if you want to mix it up, go for a 3:1 ratio of granny smith:braeburn. How the apples are cut are another interesting topic. People cut them in all shapes and sizes, with varying results. I like to slice my apples thinly (not too thin or they’ll break down while baking) because I can layer them over each other in a flat stack that cuts and eats well. 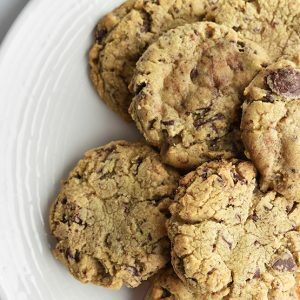 This shape is also easily and evenly coated by filling and gives a good ratio of both in each bite. It’s all about the details people! In terms of pie shells, I am a bit of a rebel (as much as you can be a rebel in reference to baking pie). I’m not a fan of the classic pie tin shape. It’s shallow, not allowing for a whole bunch of filling, and the flared sides are notorious for breaking when cut. I prefer to go deep dish, and use my cake rings as a sort of pie tin. 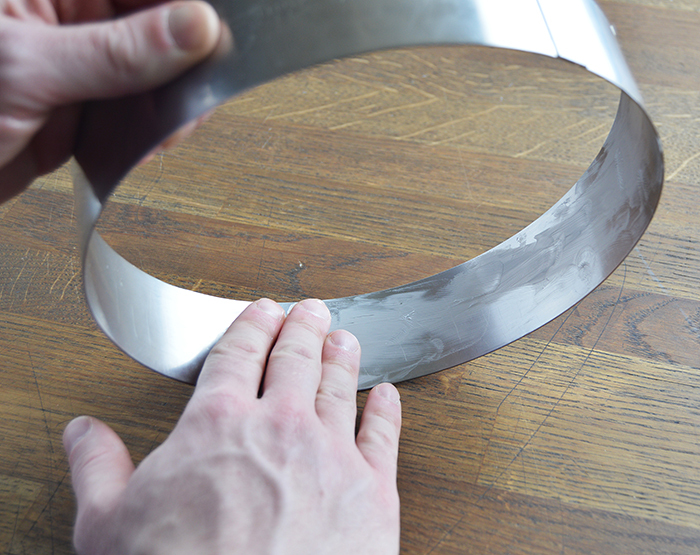 The straight edge shape is more visually attractive and a lot stronger when cutting. Plus it’s perfect for adding a ton of filling. Give it a shot! I bake my pie on two sheet pans lined with a non stick baking mat. This insulates the bottom of the pie shell so it doesn’t over bake during the long baking time of the pie. *I’ve included the pie dough recipe and method in the recipe card here, but for the step-by-step method for pie dough check out my post for here. 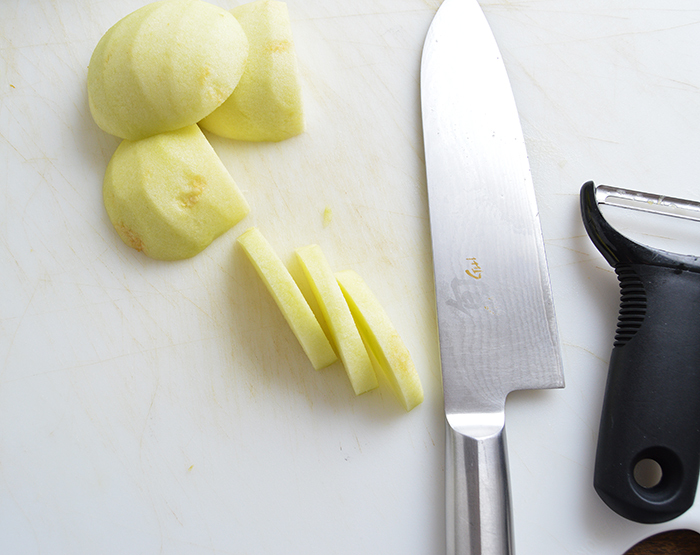 Peel and cut your apples. 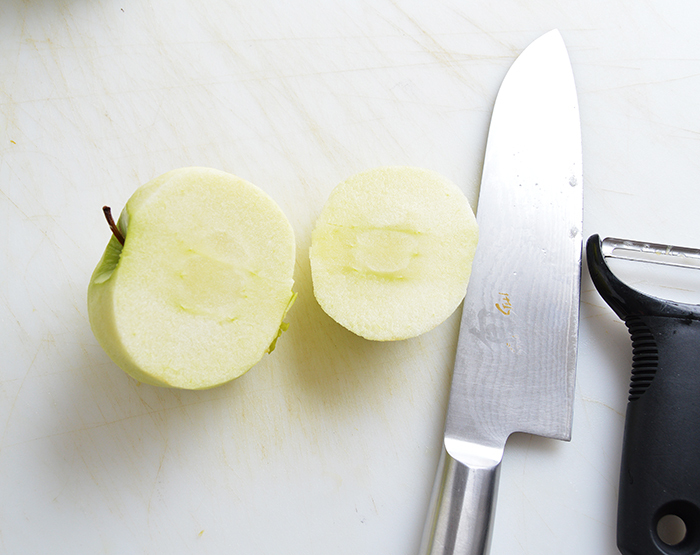 Cut them around the core and then into 1/4″ slices. Keep the slices in a bowl of lemon water to keep them from oxidizing and browning. 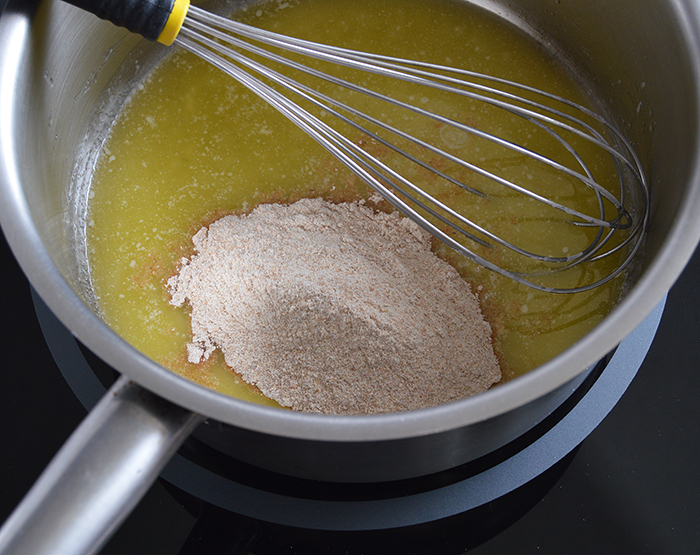 Melt the butter over low heat and add the flour, mixing it into a smooth paste. 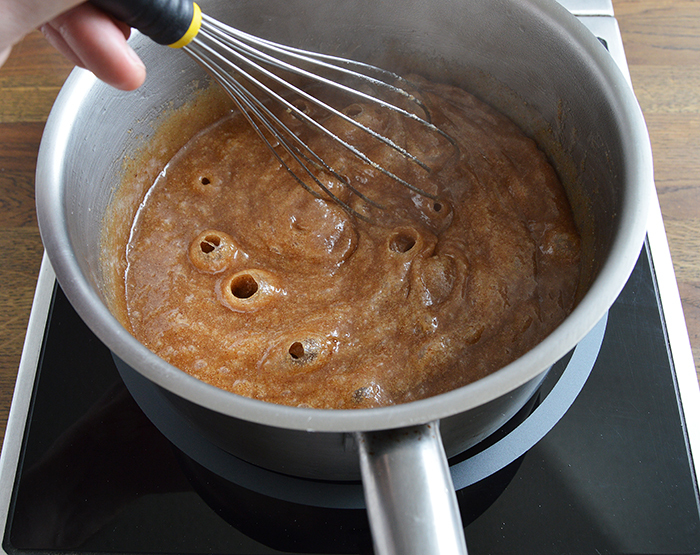 Bring the mixture to a simmer and cook, while whisking, for a minute or two until it thickens slightly. Combine the water and cornstarch and mix them into a slurry, then whisk it into the butter mixture along with the remaining ingredients. 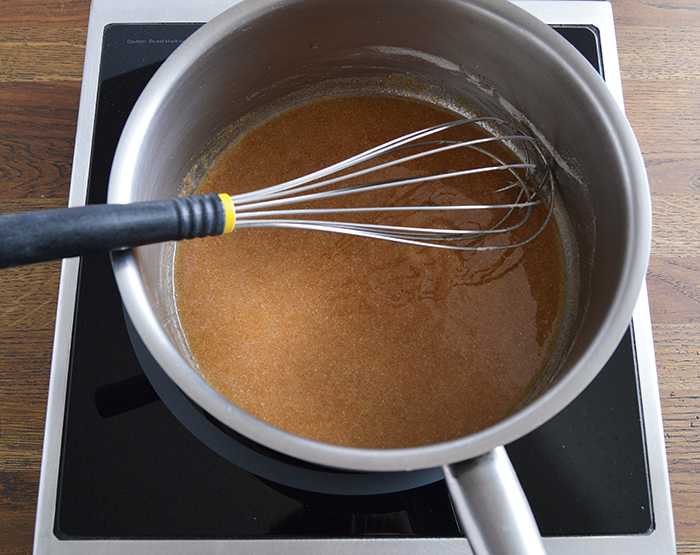 Bring this mixture to a boil and cook, while whisking, for two to three minutes until the mixture thickens. This will also cook out any starchy flavor. Let the mixture cool for about 5min and then add the sliced apples (strain them out of the lemon water you goon) and toss to coat. 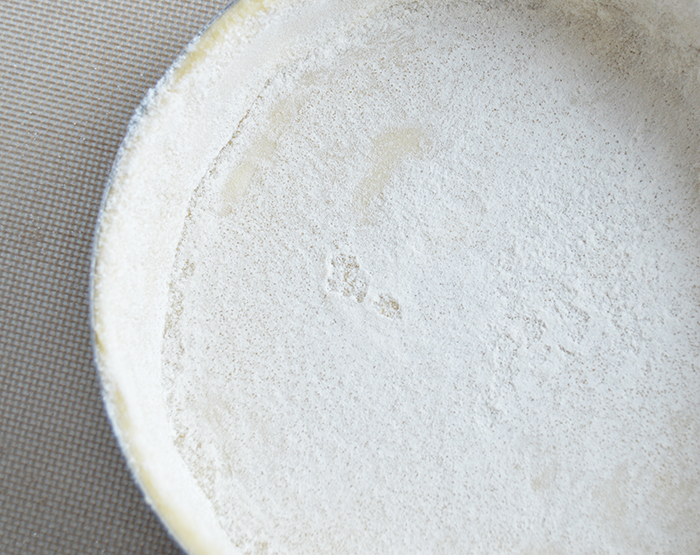 Reserve the mix at room temperature or throw it in the fridge if you plan to make your pie later. 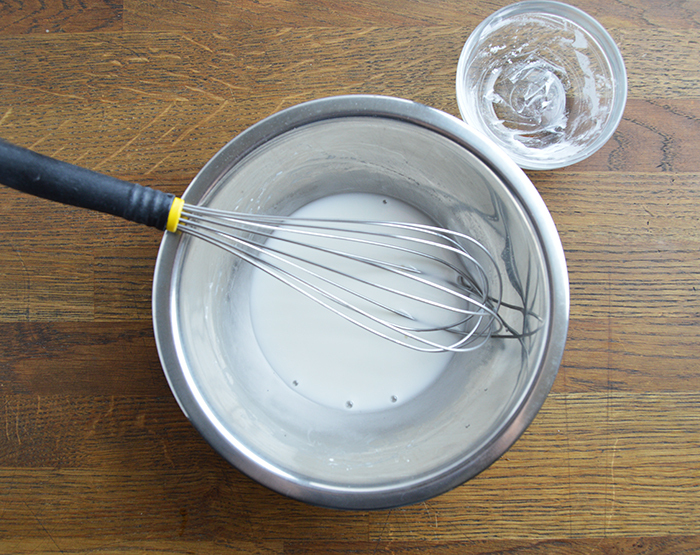 Combine all of the ingredients and mix in a stand mixer with a paddle attachment until they are coarsely bound. Apply a light coat of butter to the inside of your cake ring (I’m using a 9in / 23cm ring). This will help your pie dough stick to it a bit. 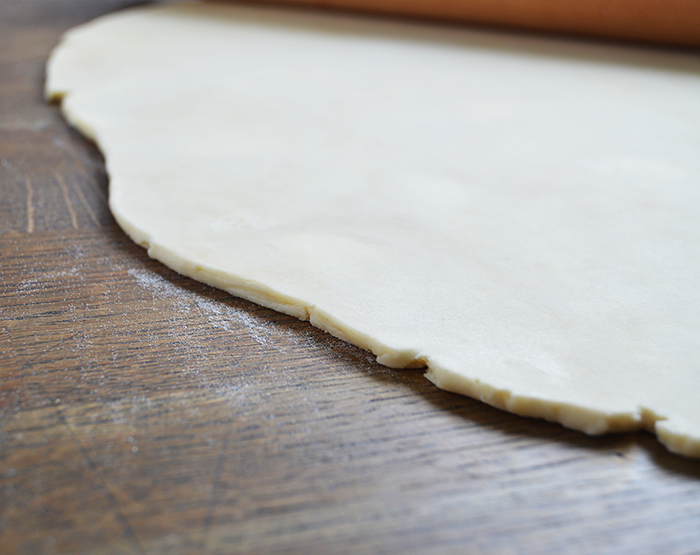 Roll your pie dough out to 1/8″ / .32cm. 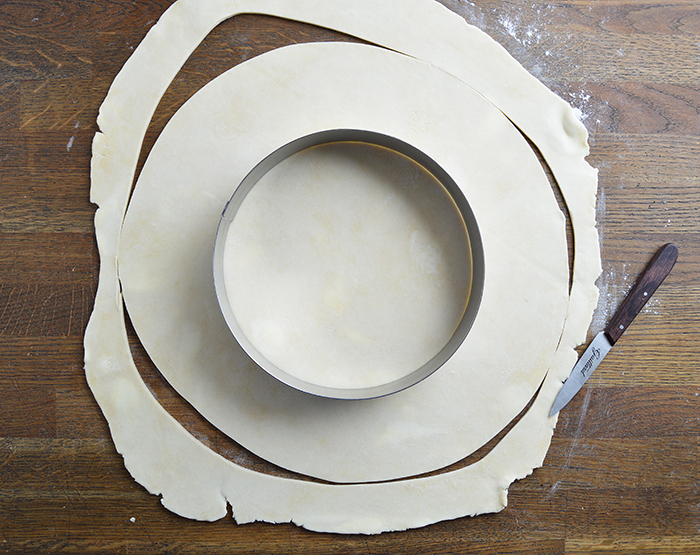 Place the cake ring into the center of your rolled pie dough and cut a circle of dough around the ring that is just larger than the height of the ring. The ring I’m using here is 2″ / 5cm tall so the band of dough around the ring is just over 2″ wide. This way you’ll know you have enough dough to line your ring! Loosely set the dough into the ring. If the dough is hanging over the edge like crazy and is becoming hard to handle, just cut off a bit of excess dough. I like to use scissors to do that. 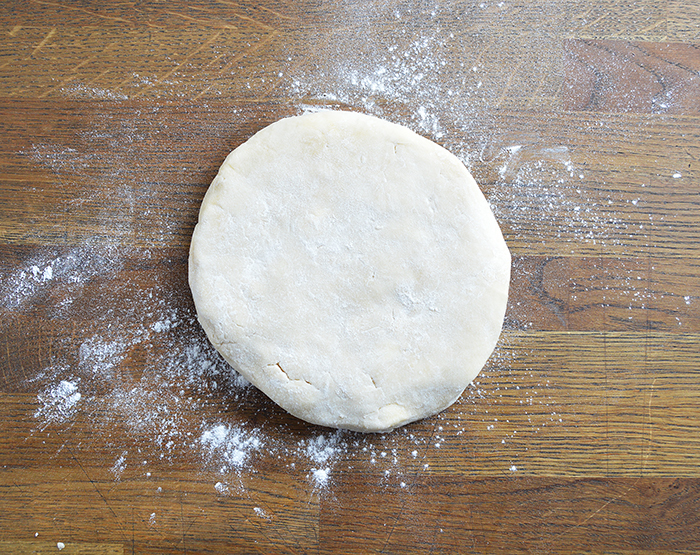 Start by gently pushing the dough all the way down into the bottom corner of the ring. 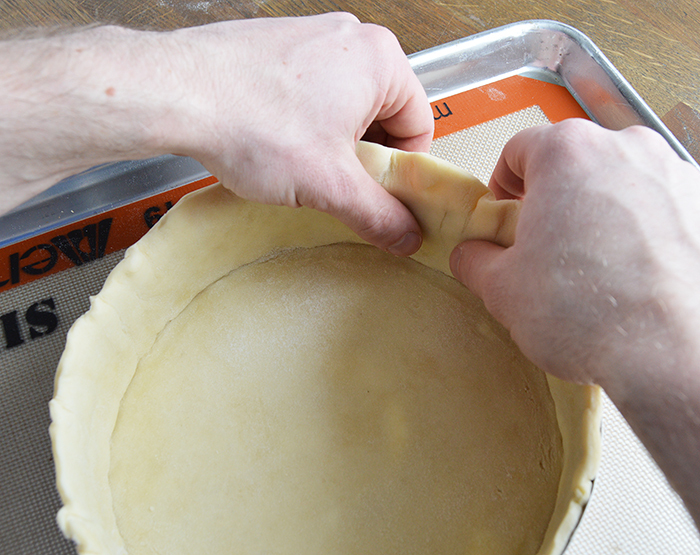 Press the dough into the corner of the ring creating a crease. Then, still gently, press the dough up the side of the ring, eliminating any trapped air bubbles. 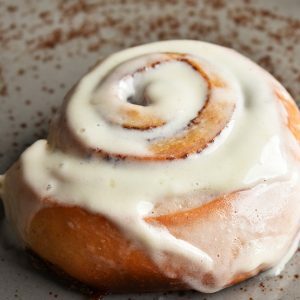 If the dough gets too warm as you work with it, don’t be afraid to throw it back in the cooler for a few minutes and then continue on. Heat is the enemy! You can see the crease being formed in the dough on the ride side of the ring. 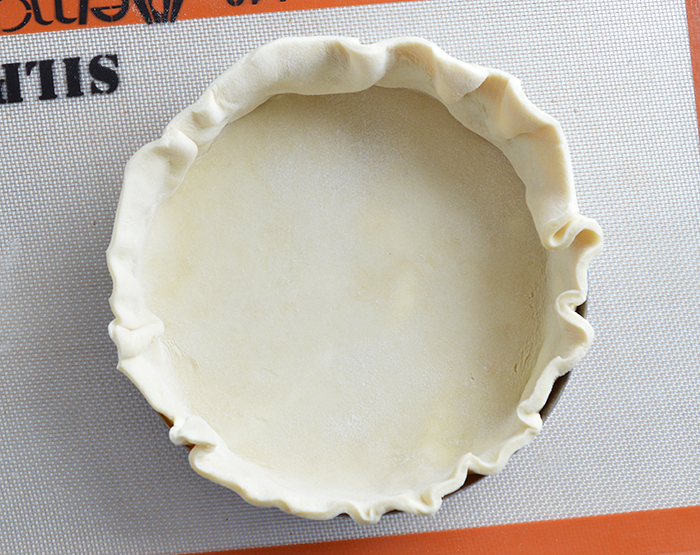 This will help give the side of the pie stability and keep it from breaking off when you cut a slice. 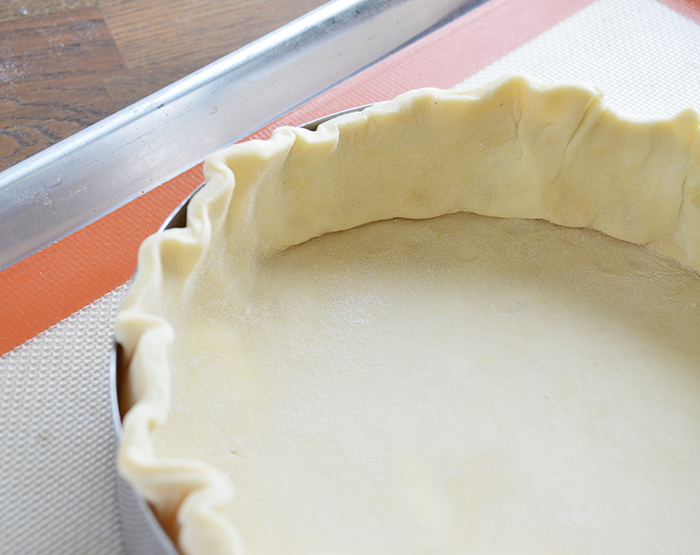 Once the pie is lined, strike any excess pie dough off of the rim with a paring knife, slicing away from the ring. 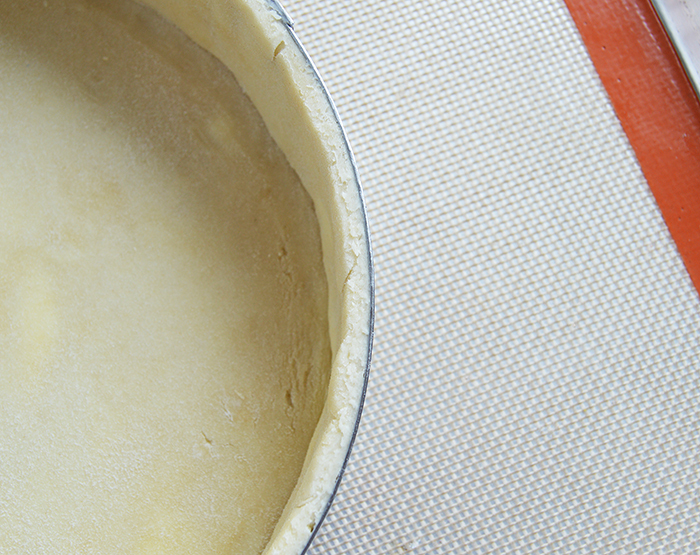 If you plan to add a top crust to your pie, you can keep this excess dough. For this apple pie, slice away. Let the dough rest, uncovered, in the fridge for at least an hour, up to overnight. This will allow the dough to dry out a little and will reduce shrinking during baking. 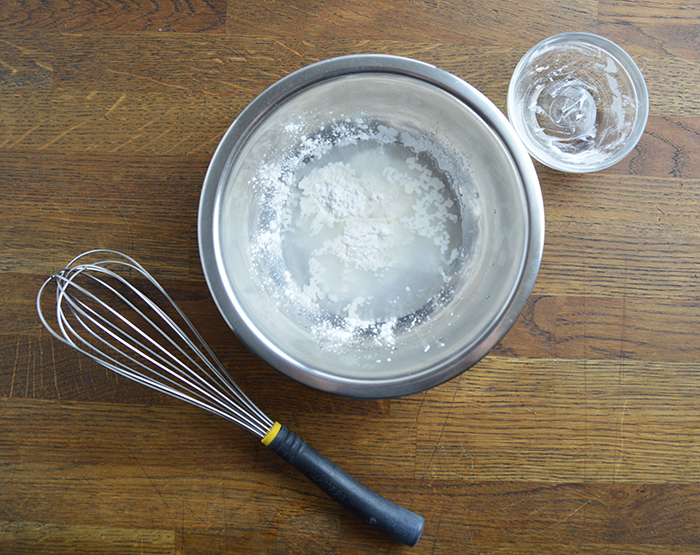 Brush your pie dough with egg whites (sides too) and then coat the dough in a mixture of 60:40 sugar:all purpose flour. 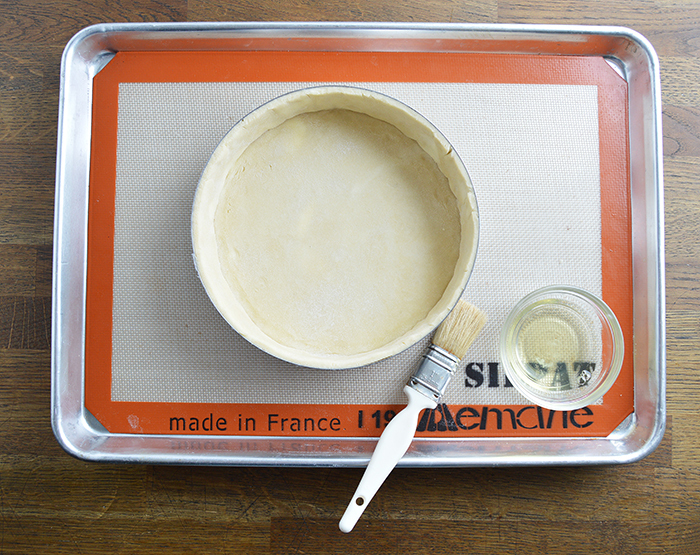 This will help absorb moisture from the filling and keep your pie dough from getting soggy. Fill your shell with your nicely coated apples. Try to pack each layer in tightly and criss cross the apple slices as you stack them on top of each other to give them stability. It’s going to look like a lot of apple packed in that shell, but they will shrink and settle after moisture is cooked out of them so don’t be afraid to get all of that apple in there. 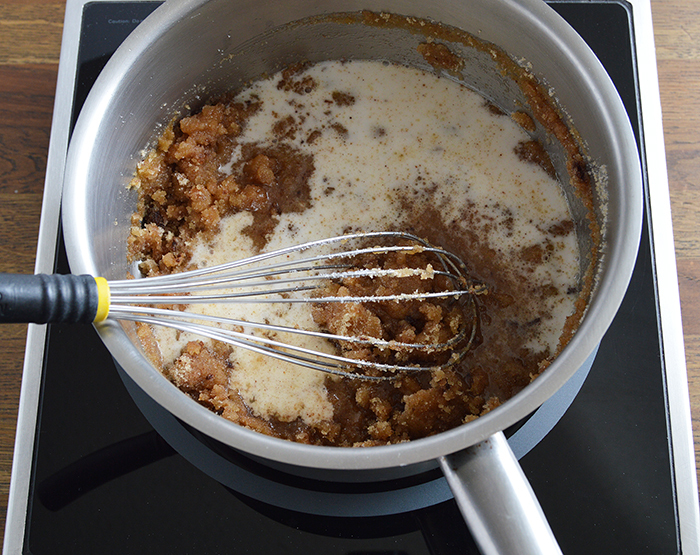 Once the shell is filled up, pour the remaining filling mixture over the top. Sh*t is getting real! 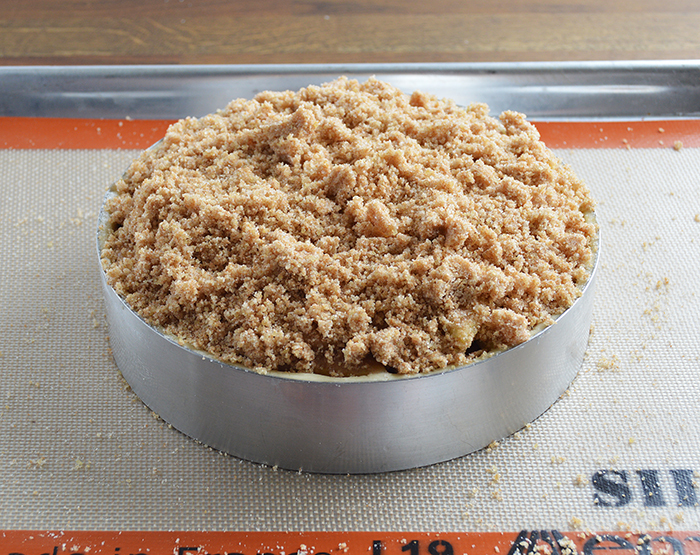 Coat the top of the pie with crumble. Lots of crumble. Bake: convection; 350F/176C for 1hour 20min; after 15min. 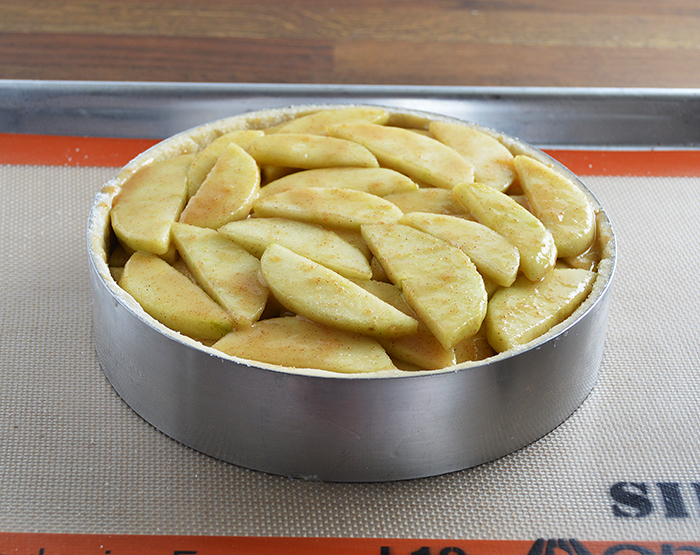 of baking, cover the pie loosely with tinfoil to prevent the crumble from burning. Poke a hole in the center of the tinfoil to allow steam to escape and finish the bake. Grandma, eat your heart out. 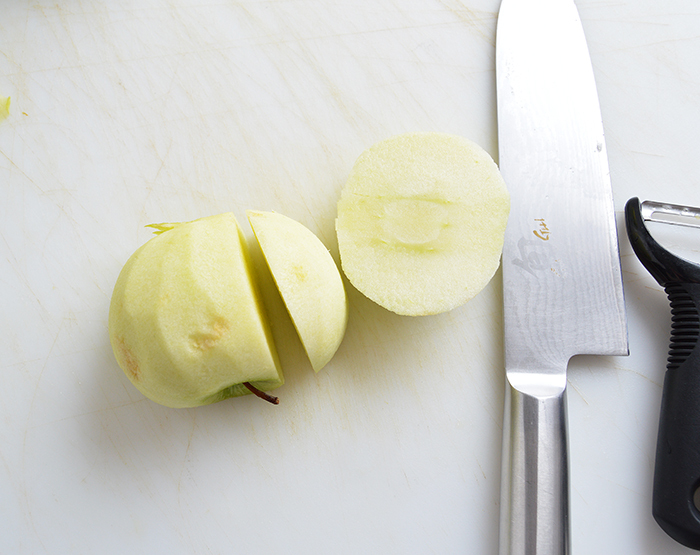 Process the apples by first peeling them, then cutting them around the core. 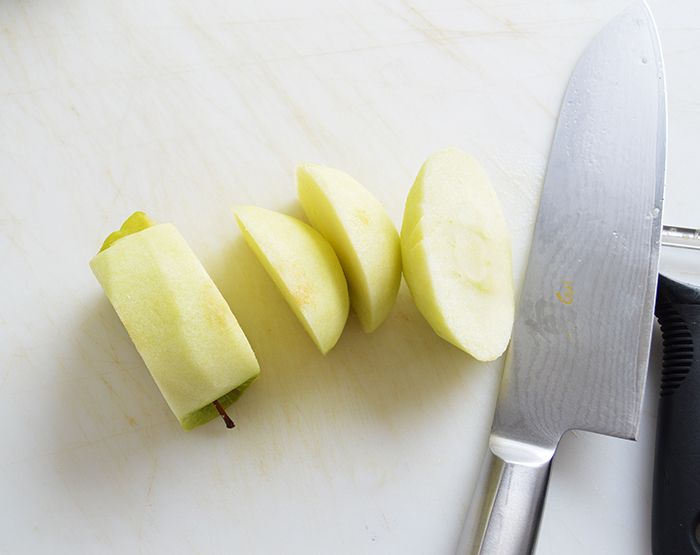 Slice the apples into 1/4" slices and reserve them in lemon water. 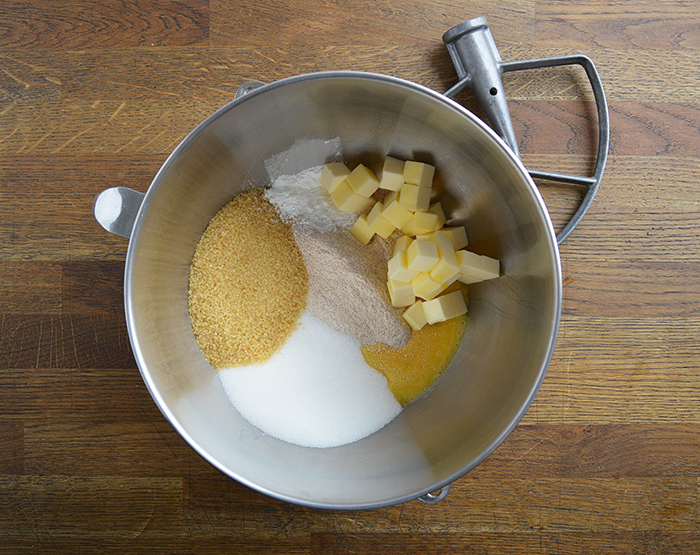 Melt the butter over low heat and add the all purpose flour, whisking until the mixture is smooth. 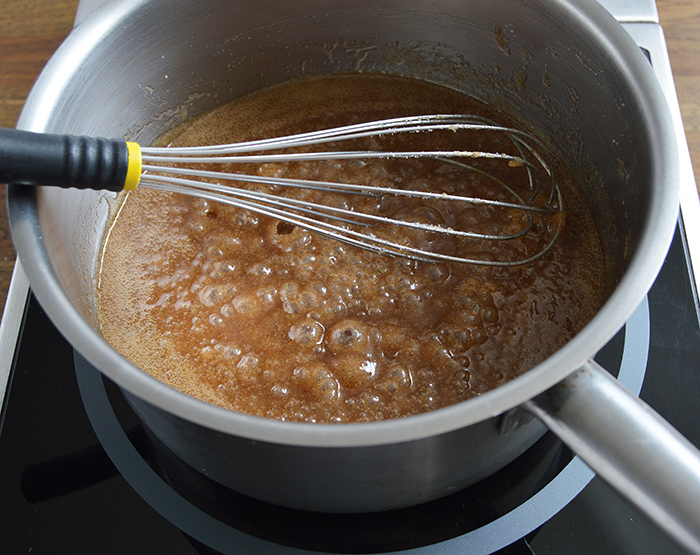 Bring the mixture up to a simmer and cook, while whisking, for 1-2 minutes until the mixture has thickened slightly. Combine the water and cornstarch and mix into a slurry. Add the cornstarch slurry to the butter mixture along with the remaining ingredients. 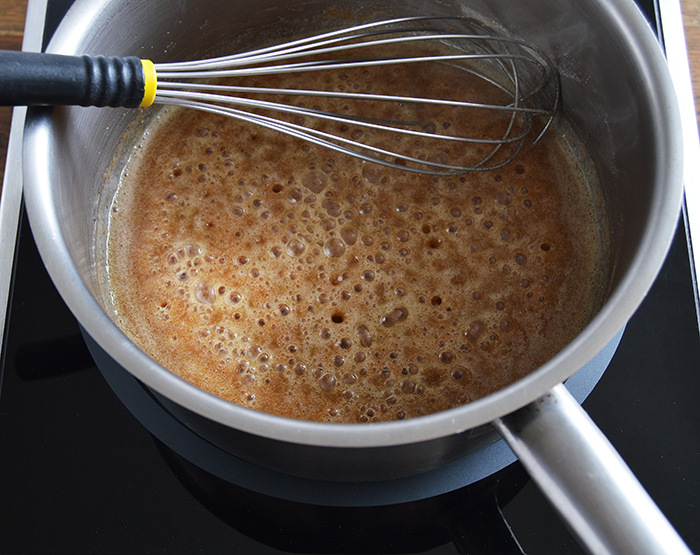 Bring the filling up to a boil and cook, while whisking, for 2-3 minutes until the mixture has thickened. 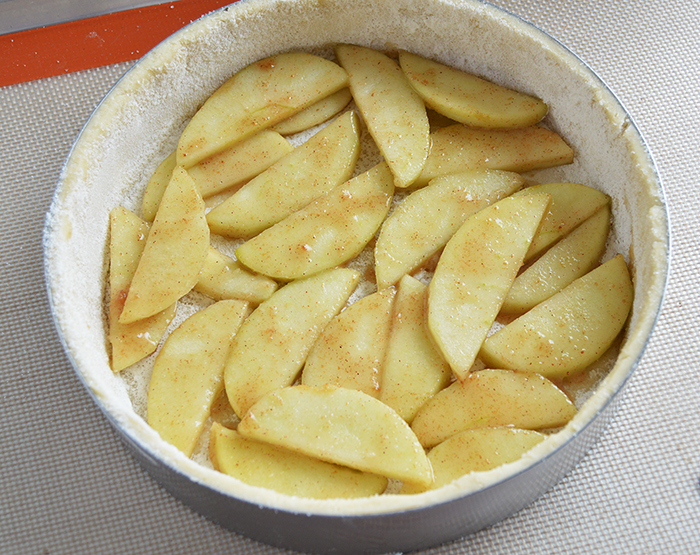 Let the filling cool for 5 minutes and add the sliced apples (strained from the lemon water). Toss to coat and reserve. 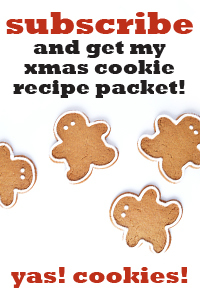 Combine all ingredients and mix until coarsely bound. Line the cake ring with a thin layer of butter. 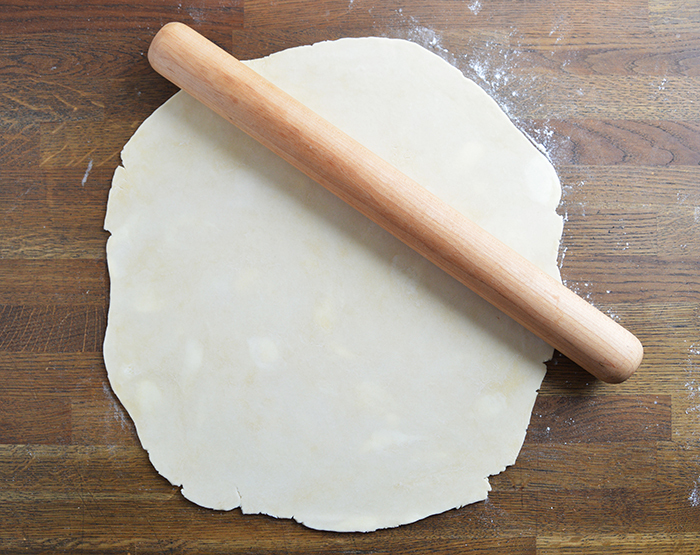 Roll the chilled pie dough out to 1/8" / .32cm thickness. Loosely set the dough into the ring. Cut away any excess dough that may make it difficult to work with. 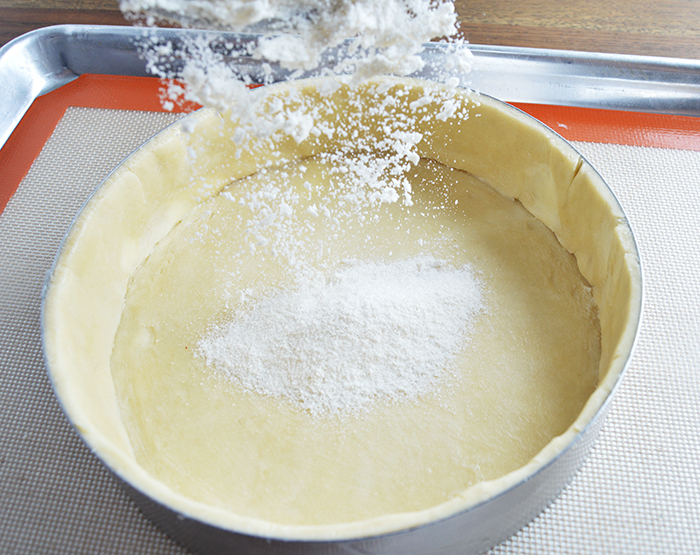 Gently push the dough all the way down into the bottom corner of the cake ring. Press the dough into the corner of the ring creating a crease. Then, still gently, press the dough up the side of the ring, eliminating any trapped air bubbles. 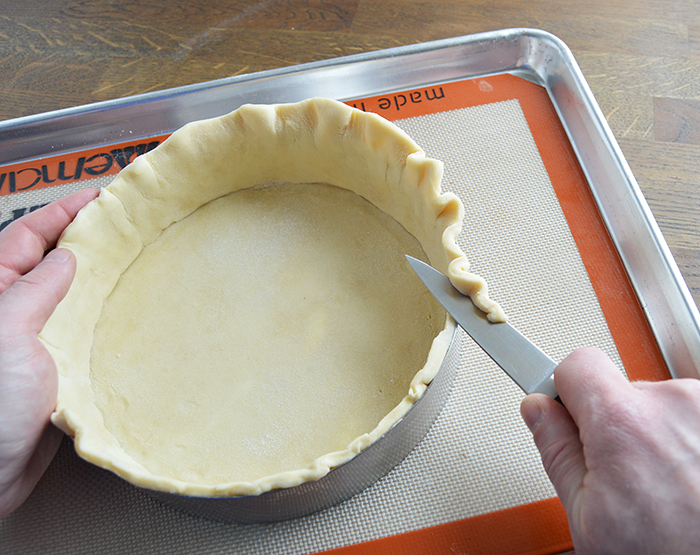 Once the pie is lined, strike any excess pie dough off of the rim with a paring knife, slicing away from the ring. Let the dough rest, uncovered, in the fridge for at least an hour, up to overnight. 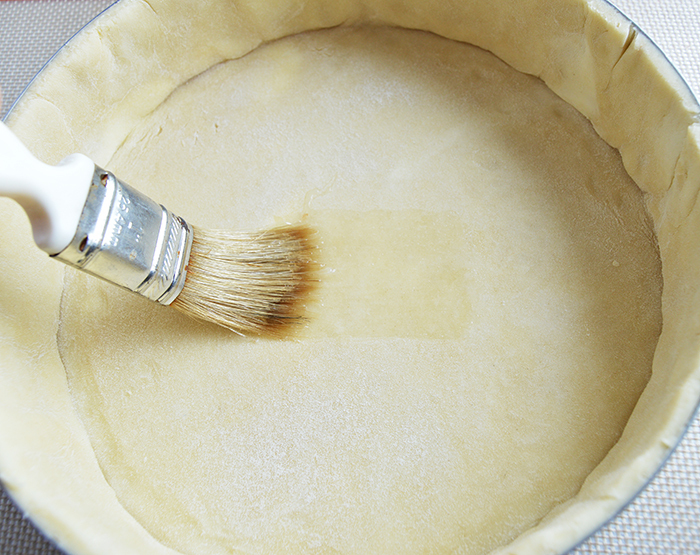 Brush the inside of your pie shell with egg whites and then coat the dough in a mixture of 60:40 sugar:all purpose flour. 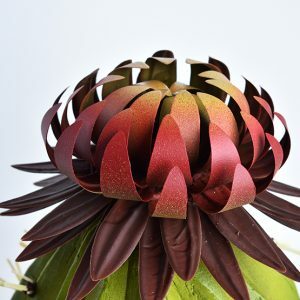 Fill your shell with the coated apples. Pack each layer in tightly and criss cross the apple slices as you stack them on top of each other to give them stability. 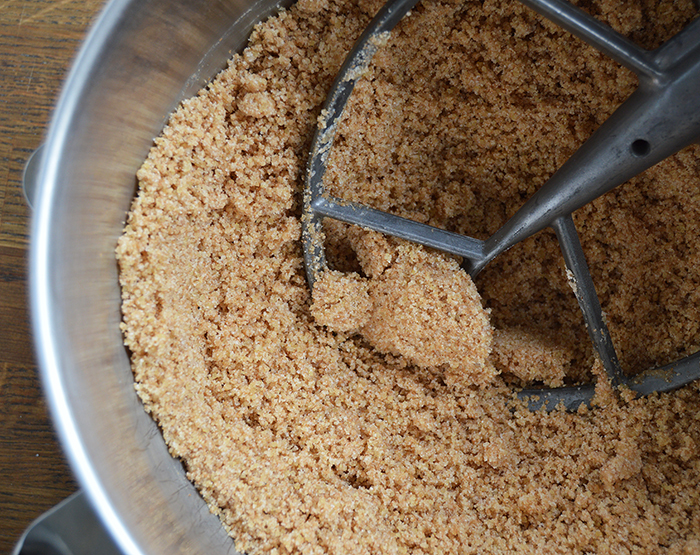 Once the shell is filled up, pour the remaining filling mixture over the top. 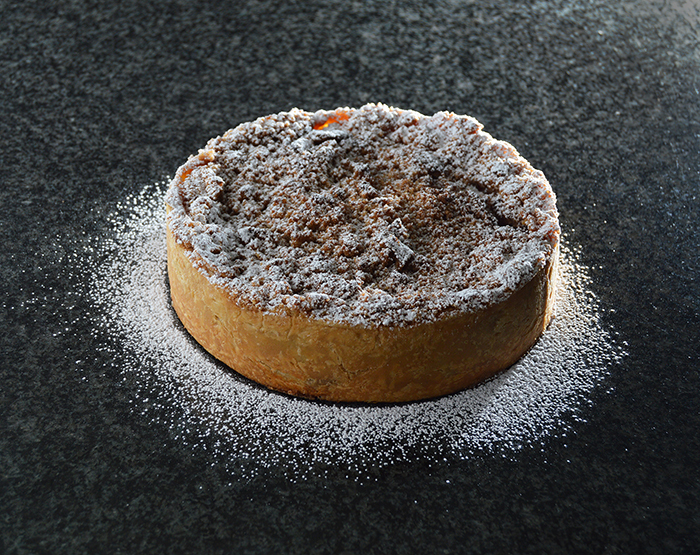 Coat the top of the pie with crumble. Bake: convection; 350F/176C; 1hour 20min; double sheetpan Note: bake for 15min and cover the pie loosely wit tinfoil. Poke a hole in the center of the tinfoil and finish baking. Just lovely! Can’t wait to try it in the fall when local orchards are harvesting apples. Thanks for the terrific photos and technique. 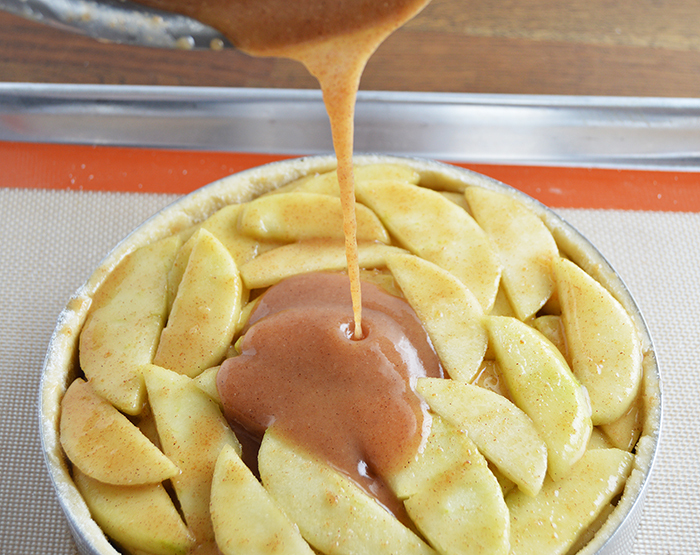 Do you have a favorite apple for pies? Thanks Lisa! 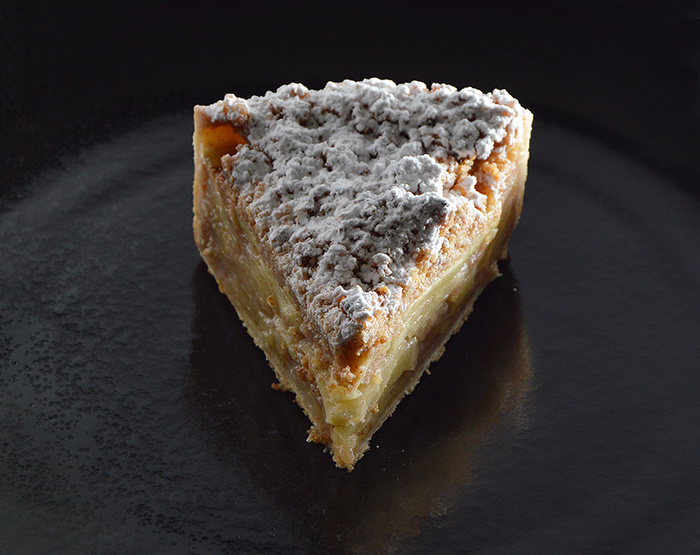 My personal favorite apple mix for pie is 70% Granny Smith and 30% Braeburn. When fall rolls around and you’re getting beautiful apples I fully expect to see some pictures! Have you ever soaked your apple slices in boiling water? 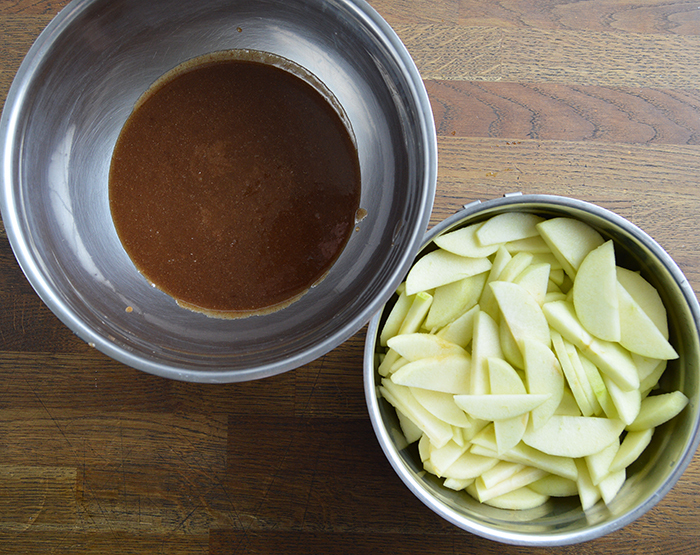 If you aren’t using as many Granny Smith apples you loose the extra pectin they provide to the structure but soaking helps par cook them and allows the cell structure to remain more intact while it bakes. I started baking apple pies when I was 13 and it took me 20 years to learn this little trick that allows for a fuller filling that doesn’t condense down. Thanks Daren! I love this trick, it’s one I’ve heard of but never tried. 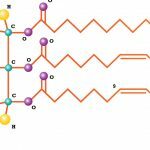 It’s a great nugget of food science for me to geek out on too. Thanks for contributing! 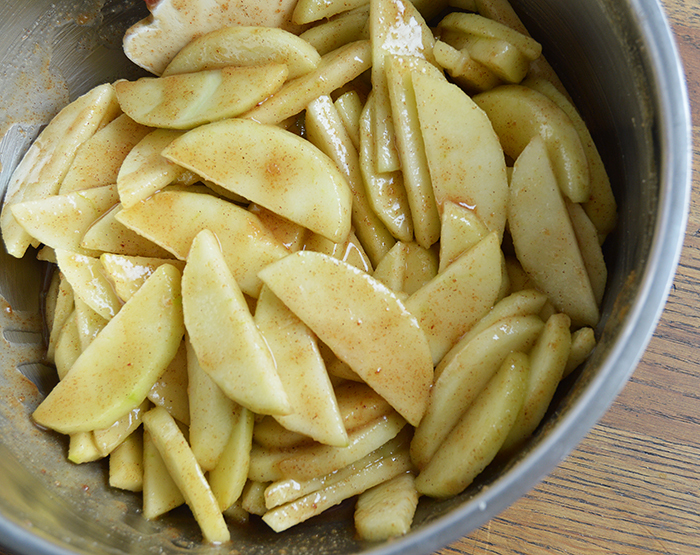 I like to pre-bake apple slices with cinnamon and a sprinkle of sugar and starch before I pile them into the beef tallow based crust. 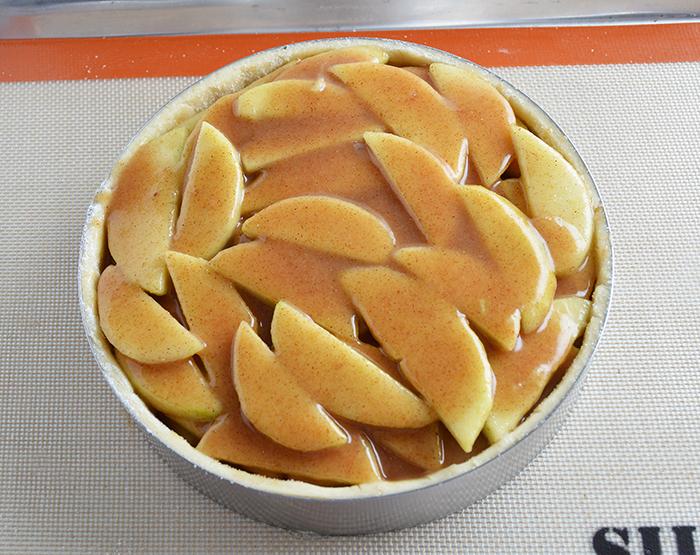 Water evaporates and apples flavor is deeper and more concentrated this way, thus less sugar can be used. After more and more studies suggest that sugar is toxic and even dangerous to health I am a bit discouraged and my baking experiments are on a decline. I try to cut down on sugar and wheat. I still enjoy reading the recipes though! Thanks! Just perfect for a 4th of July cookout with a bunch of Air Force folks! That’s so great to hear, I couldn’t be happier to hear that one of my recipes might turn into something great for our service men and women can enjoy! Have a great cookout and holiday! Chef Scott, any thoughts on when and how to unmold and plate a whole deep dish pie (at room temp? after refrigeration? 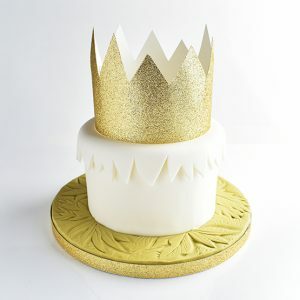 sliding a cake board underneath? )…they are heavy (made another one with fresh peaches w/ modifications for juiciness…yum) and I have the skill set to easily turn them into cobbler……. I never attempt to unmold or move the pie until it’s cooled for at least and hour or two. 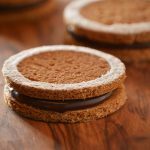 If you’re using a cake ring like I do in the recipe, then simply pulling off the cake ring will unmold it! That’s why I like using them so much. From there I always use a wide hamburger-flipper style spatula to lift and move it. Something like this. Worst case scenario, it sounds like you’ll have some delicious peach cobbler! Hope this helps, keep on baking and thanks for being a part of the DFK nation!